Launch the download of the IPD guide for Microsoft Application Virtualization 4.6. The Infrastructure Planning and Design (IPD) Guide for Microsoft Application Virtualization 4.6 enables organizations to implement application virtualization and effectively respond to the associated challenges. This IPD guide takes you step-by-step through the process of planning your application virtualization infrastructure; and now includes information on how App-V supports Windows 7 and Windows Server 2008 R2, including such features as BranchCache; support for 64-bit clients; and server-sizing data. Strategically planning your infrastructure can help you avoid problems before they begin, allowing you to serve your customers more accurately and reliably, as well as saving you time and money. Step 1: Determine Project Scope. Before designing a Microsoft Application Virtualization infrastructure, an organization needs to determine the project’s scope: that is, determine which applications will be available virtually and identify the target user population, and their locations, that will access them. The output of this step is used to determine what type of App-V infrastructure should be implemented in Step 2 and to drive the sizing and placement of the servers in Steps 5 and 6. Step 2: Determine Which Models Will Be Needed. A model refers to the process by which virtualized applications are published and delivered to users. Deciding how to deploy virtualized applications will come down to determining what model or combination of models for distribution will be required in the organization’s environment to support the business scope defined in Step 1. 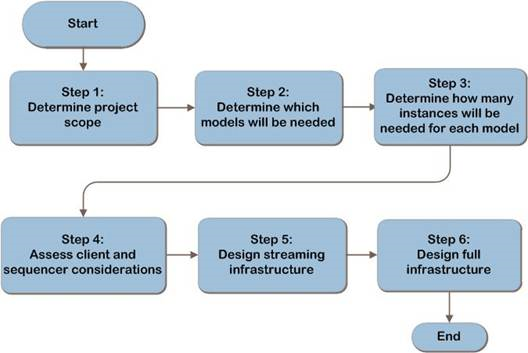 The distribution models discussed in this step are the Standalone Model, the Streaming Model, and the Full Infrastructure Model. Step 4: Assess Client and Sequencer Considerations. This step discusses certain considerations relating to clients and sequencers that need to be taken into account when utilizing Microsoft Application Virtualization in a production environment. Although these considerations do not affect the decisions around the infrastructure design, they do have an impact on the day-to-day performance and functioning of the environment. Step 5: Design Streaming Infrastructure. Streaming is the term used to describe the process of obtaining content from a sequenced application package, starting with Feature Block 1, and then obtaining additional blocks as needed. In this step, the method that the Microsoft Application Virtualization Management System will use to stream the virtual application packages, or .SFT files, from the server to the clients is determined for each location defined in the scope in Step 1. Step 6: Designing Full Infrastructure. If it was determined in Step 2 that the Full Infrastructure Model is needed, this step determines the server resource scaling requirements and fault tolerance for each role. Please send questions or comments about this guide to mailto:ipdfdbk@microsoft.com?subject=IPD%20-%20Microsoft%20Application%20Virtualization%204.6.